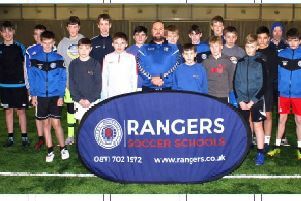 Two more island football starlets have had their footballing souls wooed across the Minch after wowing top-team scouts. Kid gloves Chloe Nicolson has been snapped up by Glasgow giants Rangers where she has slotted into their talented youth set-up. And her best mate and goal-grabber Kayleigh Mackenzie has put pen to paper on a deal with the Inverness Caledonian Thistle women’s team. The free-scoring Mackenzie had already spent six months in the club’s development squad in Inverness before being offered a deal with the senior women’s team. And she didn’t have to wait long to make her senior debut as she was handed a starting jersey leading the attack against league favourites Aberdeen. Both girls are still just 16 but have long since proved talent and ability beyond their years. Each supremely talented teen have regularly starred for their school team’s in age groups well above their own years while both were Lewis and Harris Youth Football League regulars playing against and alongside boys – Kayleigh with Western Thistle and Chloe with Point. Now though the pair are taking on the best young players in the women’s game on the other side of the Minch at Ibrox and in Inverness respectively. Chloe has already tightened her gloves around the No.1 shirt with Rangers where she has already established herself as first pick between the sticks. Kayleigh has only made one senior appearance with her recent step up to the senior team but her own reputation in the women’s game is already growing – helped in no small part with a remarkable five-goal haul netted against Rangers while playing with the youth team of Inverness. Both girls are still in school and the S5 pair remain key cogs in the Nicolson Institute football team with several fixtures fast approaching. Chloe and Kayleigh have already secured winners medals with the school in recent years and with the benefit of their recent footballing experience in their boots – few would bet against them helping bring yet more silverware to home soil.